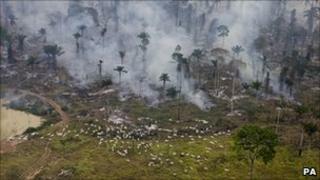 Deforestation of the Brazilian Amazon rainforest has increased almost sixfold, new data suggests. Satellite images show deforestation increased from 103 sq km in March and April 2010 to 593 sq km (229 sq miles) in the same period of 2011, Brazil's space research institute says. Much of the destruction has been in Mato Grosso state, the centre of soya farming in Brazil. The news comes shortly before a vote on new forest protection rules. Brazilian Environment Minister Izabella Teixeira said the figures were "alarming" and announced the setting up of a "crisis cabinet" in response to the news. "Our objective is to reduce deforestation by July," the minister told a news conference. Analysts say the new figures have taken the government by surprise. Last December, a government report said deforestation in the Brazilian Amazon had fallen to its lowest rate for 22 years. However, the latest data shows a 27% jump in deforestation from August 2010 to April 2011. The biggest rise was in Mato Grosso, which produces more than a quarter of Brazil's soybean harvest. "You have 300-400 lawmakers here in Brasilia sending the message that profiting from deforestation will be amnestied, that crime pays," Marcio Astrini from Greenpeace told Reuters. "The only relevant factor is the Forest Code. It is a gigantic rise." The Chamber of Deputies has delayed voting on the Forest Code amid at times acrimonious argument but could consider the issue again next week. The Forest Code, enacted in 1934 and subsequently amended in 1965, sets out how much of his land a farmer can deforest. Regulations currently require that 80% of a landholding in the Amazon remain forest, 20% in other areas. Proponents of change say the law impedes economic development and contend that Brazil must open more land for agriculture. However, opponents fear that in their current form some of the proposed changes might give farmers a form of amnesty for deforested land. The changes were put forward by Aldo Rebelo, leader of Brazil's Communist Party (PCdoB) and backed by a group in Congress known as the "ruralists" who want Brazil to develop its agribusiness sector. Can bankers save the rainforests?